Beatrice and Virgil is hard to do justice with any kind of ‘review’ so let me come right out and say it: it’s good, in fact might just be the best book I’ve read all year. It’s hard to pigeonhole it into one genre or try to explain to you exactly why it’s worth reading. It happens to be one of those stories where knowing what it’s about ruins the whole thing. So to avoid any spoilers, I’ll steer nicely away from the plot on this one. So let’s start. 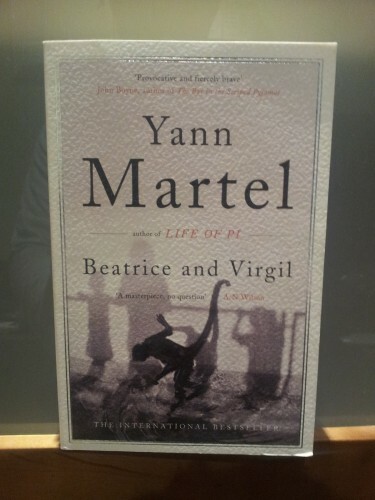 Beatrice and Virgil is written by Yann Martel, the Canadian author who wrote Life of Pi. And like Life of Pi, B&V is one of those stories that comes by once in a while and takes you by surprise with the depths of its insight. It’s this strange tale about a writer, a taxidermist, a monkey and a donkey and, like Pi, it lulls you in with the telling of a tale while carefully setting things in motion. There’s plenty in the story to keep you engrossed from page to page but by the time you realize what it’s all about, the book is over, leaving you alone to wrestle with its ideas. In that sense the book is brilliant. In that sense, it’s also disturbing. Beatrice and Virgil is one of those books that has continued to haunt me long after I’ve finished it. It’s a rare story, told by a master, that ropes you in and feels satisfying to read just page to page. It also leaves you with plenty to think about; in this case, almost too much. The heaviness of the ideas means the book is not probably not for the faint of heart but I truly respect the author for being willing to tackle subject matter of this kind. It will probably make more sense on subsequent reads; that I certainly plan to do in the future. For now, I give it a strong recommendation to anyone who appreciates works of the literary crust or just wants something truly brilliant to read. I’d suggest Life of Pi first just because it’s a bit lighter on the senses but if you liked that, then I could not recommend this any more.